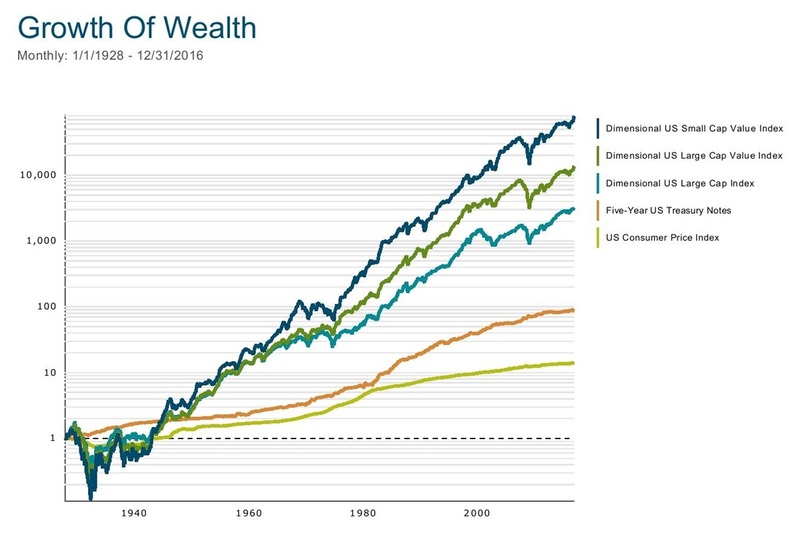 If I could use only one chart to explain investing, this would probably be it. Let’s consider, in just a few words, all that these five squiggly lines and labels tell us. First, to get ahead with investing, you not only have to earn a return, you need a return that exceeds the rate of inflation (CPI). Over the last 89 years, inflation has compounded at 3% a year; you needed $14 in 2016 to buy what only took $1 in 1928. Another way to say this is if you had $1 in 1928, its “purchasing power” was only $0.07 today. Second, there is a very clear relationship between short-term risk (volatility and losses) and long-term returns. Five-year bonds experienced minimal risk but barely outpaced inflation. $1 only grew to $87. Through the early 1980s, they only matched inflation (50+ years with no return in excess of inflation). Large cap stocks, in comparison, were much more volatile and had much higher long-term returns. $1 grew to $3,175 over this period due to about 4% per year higher returns than bonds (+9.5% vs. +5.2%). Third, while important, the stock/bond ratio isn’t the only decision investors should consider. Shares of lower-priced value and smaller cap stocks are more volatile than traditional large-cap stocks, and the reward for that risk was even higher returns. US large value stocks produced +11.3% a year, and US small value stocks did +13.5% per year. Due to the power of compound interest, that propelled $1 to $13,591 and $78,639 respectively. Little differences in return add up over time. Finally, let’s consider the trajectory of these returns. There are no permanent setbacks. Even the Great Depression (1929-1932) at the beginning of the period was history within a few years. 1973-1974? 2000-2002? 2008? For diversified stock portfolios, these are all just unfortunate but unavoidable blips on a path that marches ever higher over time. There is a significant reward for the investor who can sit patiently through these setbacks. Investors who cannot often pay a steep price in the form of missed-out-on returns or a loss of their purchasing power. If you would like a second opinion about your investment plan, or greater clarification about how these long-term asset class relationships can be applied to help you achieve your financial goals, don't hesitate to contact us. We are happy to discuss your financial situation with you further. Past performance is not a guarantee of future results. Indexes include the reinvestment of dividends but not additional real-world costs such as expense ratios or advisory fees. This content is provided for information purposes only and should not be considered a recommendation or endorsement of any particular security, strategy, or service.